Sofritas will soon be available at a Chipotle near you. Culinary manager Nate Appleman explains how the humble bean curd won its slot on the menu board. “It was really ingredient driven,” Chipotle culinary manager Nate Appleman explained to Fast Company. As Fast Company‘s Ariel Schwarz explained last fall, the burrito maker partnered with Hodo Soy for the main ingredient in the then-unofficial meatless taco filler. The Oakland-based company has amassed a hearty following for its tasty, organic, and GMO-free soy-based protein. Appleman, who worked in several Bay Area restaurants before coming to Chipotle in 2010, was one of those fans. Under his guidance, Hodo debuted at ShopHouse, Chipotle’s Southeast Asian-style outpost, which opened in Washington, D.C. in 2011. A little over a year later, Appleman started experimenting, mixing Mexican flavors with Hodo’s tofu. Eventually, a chili-based recipe stuck. “We just fell in love with the product itself and came up with something that I think even if you’re not a vegetarian or vegan, you could eat it and love it,” he said. That’s one key reason Hodo’s tofu appealed to Chipotle: It tastes better than “99% of the tofu products you’ll find in the grocery store,” as Schwartz put it, and it therefore may appeal even to carnivores. The chain restaurant had tested a vegan option, the Garden Blend, once before, and it did not meet that taste standard. The current tofu-based recipe started out as a chorizo substitute and took a year to perfect; one of the final recipes contained honey, which would have DQ’d it for vegans. But Appleman realized Chipotle would miss a huge opportunity to appeal to a group of eaters that not too many fast-food behemoths even consider. And meat eaters so far haven’t been deterred: Appleman says he has even seen people mix the tofu with chicken, for example. 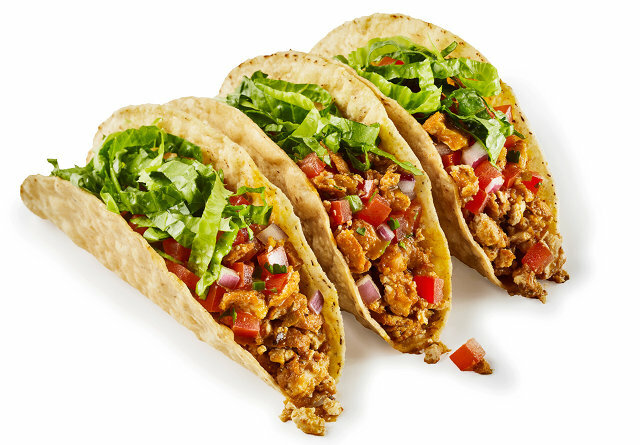 All in all, customer feedback has been positive and tofu burritos, tofu tacos, and tofu bowls make up 3% of sales in restaurants, and that’s with “very little marketing,” added Chipotle’s communications director, Chris Arnold. I, a meat eater who appreciates tofu, went to taste it with a vegetarian companion. We both happily ate our entire sampling. My colleague, Jessica Leber, applauded the texture. Tofu dishes can be spongy; Sofritas comes chopped up so that it almost feels like eating chorizo. As for the taste, it has a chipotle chili flavoring, which isn’t overpowering, but it’s there. So you have to like a smokier taste. Beyond its tastiness factor, the inclusion of soy also fits in neatly with Chipotle’s branding strategy. The chain’s last few marketing pushes have highlighted its commitment to sustainable farming. Which is great, despite the unfortunate reality that Chipotle can’t always get the ingredients it wants and often serves commodity meat. Sure, offering tofu might shift some meat eaters away from steak. Or, it might just attract the already converted to Chipotle, which would be good for business, but has less of a humanitarian ring to it. That second point is also arguable: Soy isn’t that great for the environment. Although, to Hodo’s credit, its creation is organic and GMO-free, making it a better bet than factory-farmed meat. Plus, unlike grass-fed organic beef, the tofu will never run out. Before making Sofritas official, Chipotle worked with Hodo to ensure that it could meet demand without compromising quality. “We didn’t want to take shortcuts and get a product that was not as good at the one that we started with,” says Appleman. Chipotle’s new menu item raises one other important question for hungry burrito lovers: Now that they’ve cracked the seal for new menu items, does that mean we can expect some of those “secret” menu options to start appearing as well? Unfortunately, it doesn’t sound like it: “We don’t recognize whatever you’re speaking of–‘off menu items,&apos;” said Appleman.